These two slim paperbacks serve up substantial food for thought about the sacredness of the family dinner table. 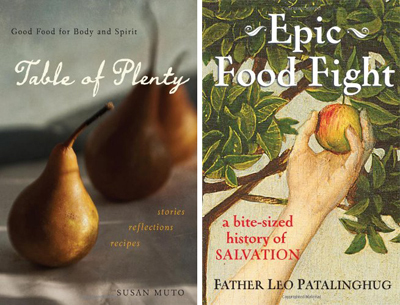 First, Susan Muto’s “Table of Plenty: Good Food for Body and Spirit” offers inspiring stories, reflections and recipes garnered from her Italian-American childhood. Her mother Helen, a full-time homemaker, adhered to “slow food movement” principles long before their modern “discovery.” She approached cooking as an activity to be shared and savored itself, as much as the meal it produced. As simple, good food was consumed at a leisurely pace around the family dinner table, Muto observed “sullen silence” give way to “friendly banter.” Visitors who were not accustomed to praying were even inspired to say a thanksgiving prayer after a meal, not just the usual blessing beforehand. Muto directs the Epiphany Association, a nonprofit ecumenical education, consultation and research center, and earned a doctorate in English literature from the University of Pittsburgh. This seems a fruitful background for her book, which communicates significant spiritual ideas in accessible prose. She is perfectly at home unpacking scriptural food metaphors (“land of milk and honey”) and early church history, and then recounting the practical details of a special family meal — even in the space of a single paragraph. This combination of narrative erudition and storytelling is very engaging. Muto was fortunate indeed to grow up in a home where cooking and shared meals were so clearly understood as a manifestation of divine creativity and caring. Her essays and reflections are thoughtful and warmly told and her mother’s recipes are an added treasure. From this basic idea, he springs to explore broader theological aspects of food in “Epic Food Fight.” This battle, as Father Patalinghug sees it, is the cosmic one between good and evil. Where does food come in? Well, he writes, “the devil is a master at ‘plating’ — presenting his dishes artistically, interestingly and appetizingly.” Meanwhile, “the church is still learning to plate the beauty of truth in a way that makes people want to taste it, consume it and live it.” Jesus, of course, was the master of this, as shown by the crowds that flocked to hear him teach and perform miracles. Such playful wit enlivens “Epic Food Fight,” which takes the reader on a tour of various aspects of salvation in seven different chapters. Topics include the role of the sacred priesthood (the “front lines of the food fight”) and the sacred relationship and role of married couples. In “Feeding the Hungry — Body, Mind, and Spirit,” Father Patalinghug discusses the importance of the corporal and spiritual works of mercy. He addresses the long-standing conflict between the spiritual and the temporal — between those who are more focused on the next world, and those who emphasize achieving social justice in this one. We need to set our sights on both, he writes, noting that “The one thing that has always brought the church back to the faith’s foundation is service to the poor — particularly feeding the hungry.” In this way, food becomes a touchstone that directs us to our roots. The final chapter presents Father Patalinghug’s 10 commandments for personal dieting. These include, for example, the sensible: “Eat with humility whatever is set before you,” “Avoid the sins of waste, gluttony and an immature appetite” and “Pray before every meal.” He also counsels, “Avoid the temptation to turn a human diet plan into an organized religion” and “Don’t engage in scrupulous worry about food.” This sort of balance is refreshing and is reinforced throughout the book. “Epic Food Fight” lends itself to nonsequential reading; one can pick it up, digest a chapter and then return to a different section. In fact, each chapter could inspire its own retreat or meditation; the discussion questions provided could easily serve as catalysts for thoughtful reflection.